We were staying in a nearby hotel (Not the one attached to the restaurant), and stopped in for dinner. We were a little hesitant after reading some of the other reviews, but thought we'd give it a chance. I am very glad we did! We were sat quickly, and our server brought us menus and took our drink order, as well as putting in the food order for our 8 year old who was already pretty hangry. Food came out quickly and was really, really good! We had the bang-bang shrimp appetizer, which was spicy and delicious. I ordered the southwest chipotle burger and it was super good as well. HUGE, juicy on a pretzel bun. My wife ordered a buffalo chicken sandwich which was also very very good. 10/10 would eat here again! Been here a couple of times before and once after this experience and in the past been happy. See other reviews. But this time was different. It was a Saturday evening mid month about 5:30. When we entered the place was not full. One booth one table plus a small group of 12 to 15 people. Sit down in a booth and order dinner. And we wait and wait and wait for food. After about an hour our food comes. It’s OK but that’s an awful long wait. If I recall we did not get any warning when we we placed our order it was going to be a long wait. The server or manager did not come anytime during our wait and tell us anything why. I recall there was comment when we paid that there was a hockey team having a meal. My wife did notice a small group of less than 20 having a meal in another room. Very disappointing. Silver stick is not a new event. Surely the6 can schedule enough staff to provide speedy service as the restaurant was over 1/2 empty. Beware of Silverstick weekend. !!! Absolutely horrible service! Came in for lunch, barely 10 tables, and we were told it was 30 mins wait for food. When we asked why, the girl said "I don't know, I wad just told that". Several other tables and guests were complaining and the manager barely cared. Took almost an hour for 2 orders at our table. In addition, when the food came out, did not taste good. Major overuse on the salt! I do not recommend this place at all!!!!! 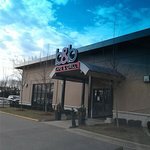 Been to B&B Taps & Grill? Share your experiences!